Perhaps I'll see you at the LEDs and the SSL Ecosystem 2013 conference in Boston, October 28 and 29. All LED Lighting community members can get discounted registration; see below. 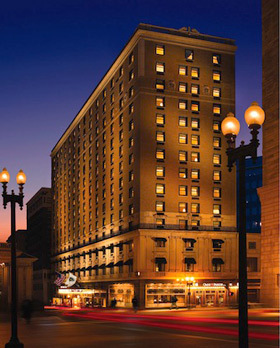 The Omni Parker House Hotel, Boston, Mass. The lineup looks particularly strong, with two presentations by Philips (Lighting and Color Kinetics), one from Osram Sylvania, one from Cree, market forecasts from SEMI and IHS, and talks by researchers from Pacific Northwest National Laboratory, Rensselaer Polytechnic Institute, and the MIT Media Lab. This is the subtitle of the conference this year. As the industry matures the emphasis will be shifting from first-mover advantage and building market share to more stress on sustainable business models. What does the SSL industry look like as the replacement light bulb market saturates? Jed Dorsheimer from Canaccord Genuity will be addressing that topic. A panel of venture capitalists will be sharing insights on what varieties of startups they are looking to fund now and in the future. And the CEO of a company staking his business on software in the SSL ecosystem will talk about what happens when value moves downstream in this industry, as it always does as a technology evolves. The closing segment of the conference will look at how LED lighting is helping to transform urban infrastructure, as we move past the point where half the world's population lives in cities. This landmark was passed in 2008, the same year that saw more devices connected to the Internet than people. The urban session will kick off with the perspective of Susanne Seitinger, the City Innovations Manager at Philips Color Kinetics. (A sister company, Philips Lumileds, sponsors this site.) Dr. Seitenger will talk about the roles SSL can play as urban networks and sensors become tools in pursuit of the dual goals of increasing efficiency / control / convenience, and enhancing sociability / transparency / fun. I will be particularly interested to hear the presentation following that of Dr. Seitinger. The highway division administrator for the Massachusetts Department of Transportation, Frank DePaola, will update us on the project to procure and install 25,000 LED fixtures to replace the failing lights in Boston's tunnels -- a subject we visited and discussed last June. All LED Lighting is a media partner to the conference's organizer, Smithers Apex. Members of this community can use the code ALLLED13 for $300 off the full conference fee. This will essentially get you the early-bird price three weeks after that rate has closed out. I'll be blogging and, probably, live-tweeting from the conference on Monday and Tuesday October 28 and 29. I hope to see you in Boston.